It is Tuesday, so I am bringing you other three gems from the web. This week’s topic is creativity and innovation. They are three sites I like to visit often to read inspiring texts, see inspiring interviews and find inspiring ideas. If you are into creativity and innovation, I am sure you will like my suggestions. 1. First pick is another YouTube Chanel, and I am suggesting it because it just released a series of interviews called “30 Days of Genius”. 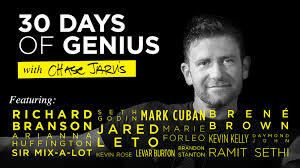 The interviews are conducted by Chase Jarvis, a really inspiring individual himself, who talks to creative entrepreneurs and thought leaders, and believe me, he’s got an impressive display of famous overachievers. I realy enjoyed it and it helped me discover people such as Brene Brown, Arianna Huffington or Elle Luna, on top of already famous Tim Ferris, Jared Leto or Sir Richard Branson. All the interviews are inspiring and fun to watch, you can acquire plenty of ideas and a nice creative spur. 2. 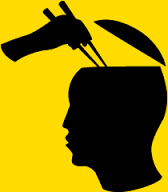 The second choice for this week is www.brainpickings.org. It is a really useful and exciting website focused on books and artworks. They debunk meanings, they explain trends and artistry, they collate ideas, they basically give you already “digested” knowledge, easy to comprehend, easy to apprehend. Go and have a look, make use of the search engine to go straight to what you are interested in, or just browse and discover. You will become addicted! 3. Last, but definitely not least, is www.trendhunter.com. This is another place to dive in and lose yourself for hours and hours. But don’t do that! This is a site founded by Jeremy Gutsche that gathers innovative ideas in almost every sector (fashion, tech, design, architecture, culture, business, etc) and then organizes them in sections and subsections and gives them ratings regarding freshness, popularity, activity and also describes demographics. So, if you are into innovation, in whatever sector, go on this site and search for your relevant field and see ideas close to yours and their ratings, or even subscribe your own idea. If not, go have a look at the latest innovations in whatever area you fancy (be it stationary, home decor or whatever). Hope you like it! Let me know what you think of this week’s three picks. I am sure you will enjoy them as much as I did. Have a nice Tuesday! Thank you Chase Jarvis! Great content!